Swachh Bharat Online Citizen Communities were initiated in October 2014 by LocalCircles (www.localcircles.com) and Swachh Bharat Mission, Ministry of Urban Development in October 2014. Since then, over 355,000 citizens have become part of the various Swachh Bharat citizen communities across India. 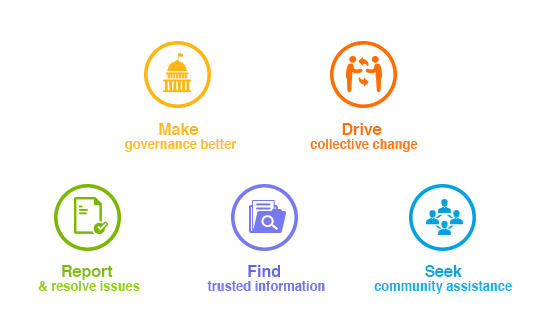 The National Community called “Swachh Bharat – Clean India” enables Swachh Bharat Mission to easily seek collective citizen inputs on various aspects of Swachh Bharat policy and state of things in real time. Based on collective citizen inputs, hundreds of whitepapers/checklists have been generated in the last four years. These cover subjects like Municipal Reforms to Civic Sense Basics for every Indian, engaging citizens in every aspect of Swachh Bharat policy making. 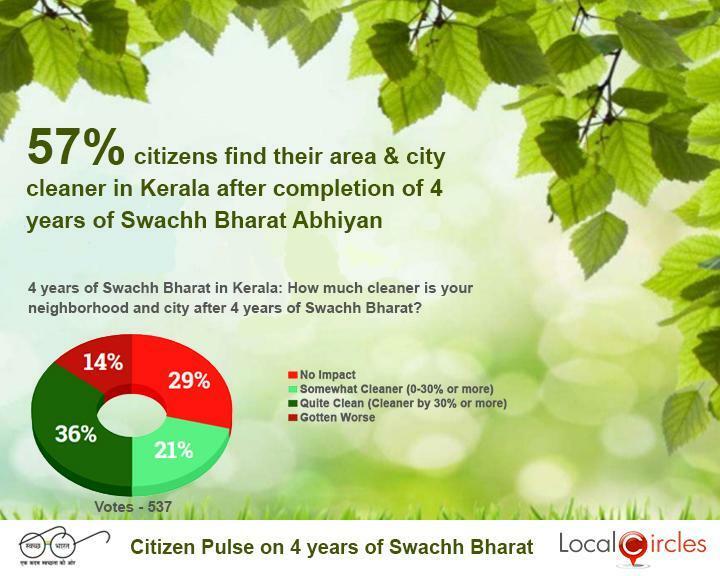 In addition to the Swachh Bharat National Circle, over 150 city level Swachh Bharat online communities are now active, bringing citizens together at a local level for discussion, collective on ground cleanliness action and to provide a platform for collective citizen engagement with the urban local bodies in these cities. The national survey on four years of Swachh Bharat was conducted in the Swachh Bharat National Circle to gauge the impact and performance of Swachh Bharat in a transparent manner. The objective was to understand what’s working and where efforts need to be put in going forward. More than 90,000 votes were polled in the survey from over 35,000 unique participants located in 220+ districts in India, making it the largest civic survey of its kind. Approximately 66% of respondents were males while 34% were females. The participants were 45% from Tier 1 cities, 29% from Tier 2 cities and 27% from Tier 3 Cities and Rural areas. 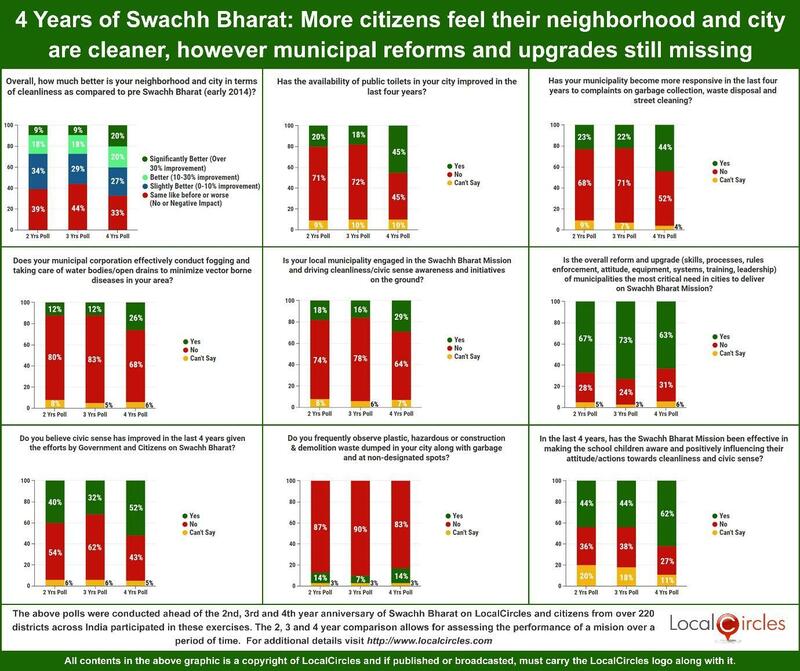 For the 4th year in a row, LocalCircles has conducted its annual Swachh Bharat survey across India and the results of this year show quite a bit of improvement in the state of cleanliness in the country. 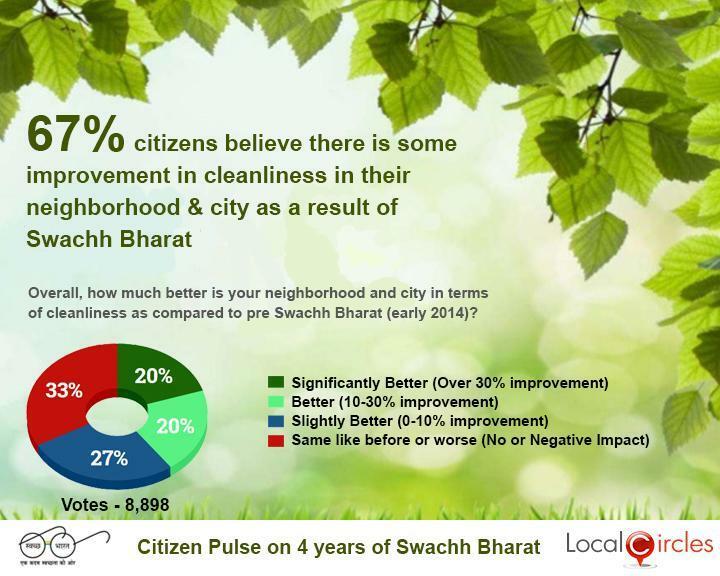 The big positive being the number of citizens who believe that their neighbourhood and city have become cleaner due to the Swachh Bharat Mission. This number has increased from 56% last year to 67% this year. The second biggest positive that came out was the availability of public toilets. The numbers here increased from 18% last year to 45% this year. Working of the municipal corporations is still a matter of concern and citizens believe that the municipalities are not aligned with the Swachh Bharat Mission. 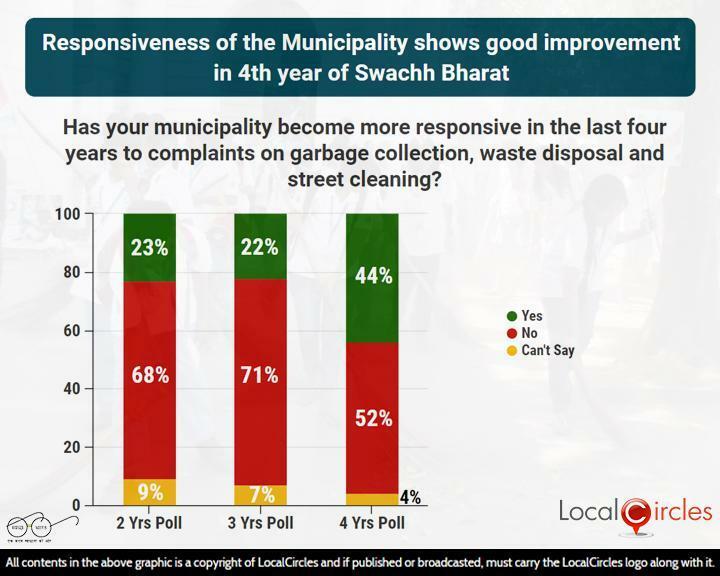 Although it shows an improvement from last year, still only 44% said that the response of their municipality on cleanliness related complaints has become better. Earlier this month, Prime Minister Sh. Narendra Modi also launched the ‘Swachhata Hi Seva’ campaign to mark the 150th birth anniversary of Mahatma Gandhi, converting the Swachh Bharat initiative into a nationwide movement. It will run from September 15th till October 2nd, 2018. Overall, the results of the 4 years of Swachh Bharat survey shows that there has been a marked improvement in the state of cleanliness of the cities. The comparison of the 1-year, 2-year, 3-year and 4-year survey also shows that the Swachh Bharat Mission has passed the time test, with almost constant improvement in cleanliness being reported by citizens. 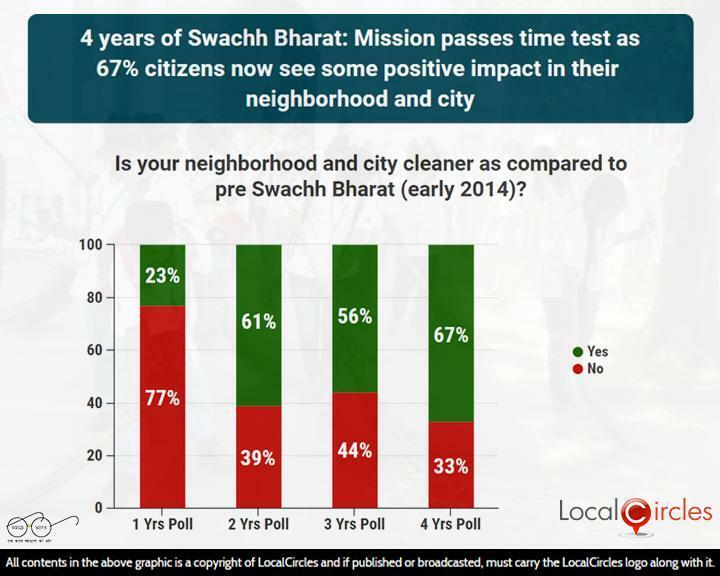 After the first year, only 23% citizens had reported cleaner neighbourhood and city when compared with early 2014 (before the Swachh Bharat Mission was announced). This number increased to 61% in year 2, dropped slightly to 56% in year 3 and rose to 67% in this year’s survey. However, working of the municipal corporations remains a concern even after the results have shown a slight improvement this year. 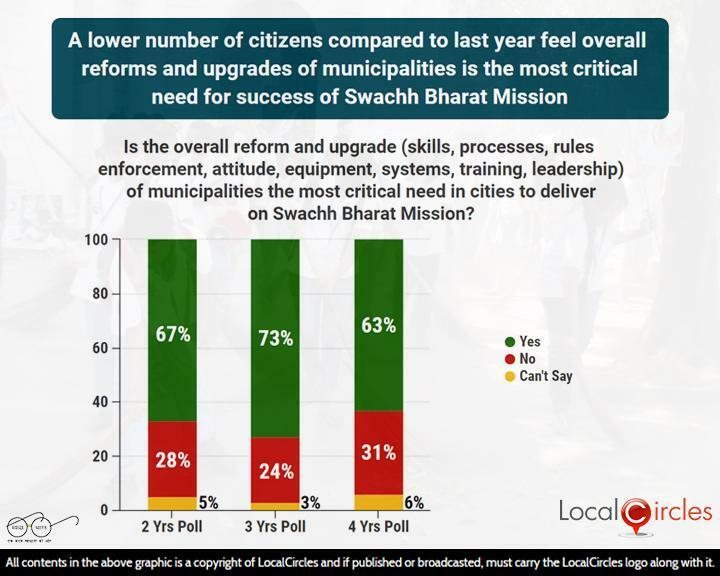 Citizens believe that municipal corporations are the link between Swachh Bharat and Swastha Bharat, and the government needs to ensure strict enforcement to make Swachh Bharat Mission a major success. 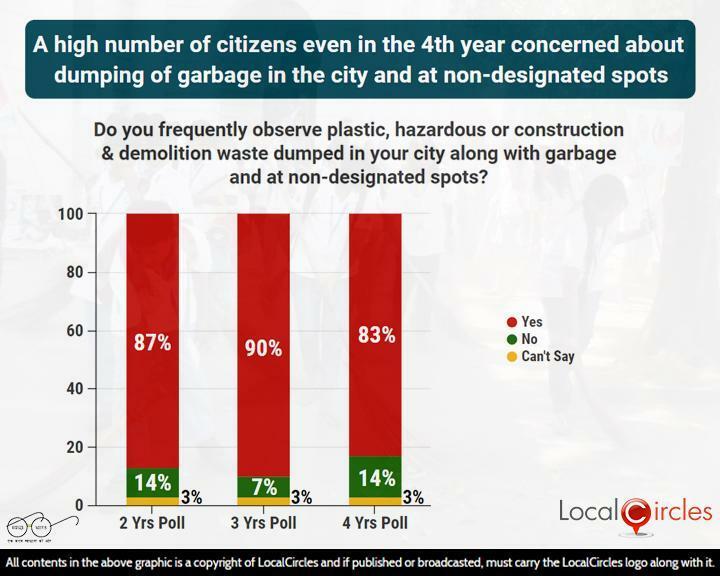 Last year after an extensive citizen consultation was done on LocalCircles, Ministry of Environment had revised its construction & demolition waste, as well as the hazardous waste management rules. But it has not had any effect as a very large number of citizens this year have reported seeing these wastes in non-designated areas in their city. 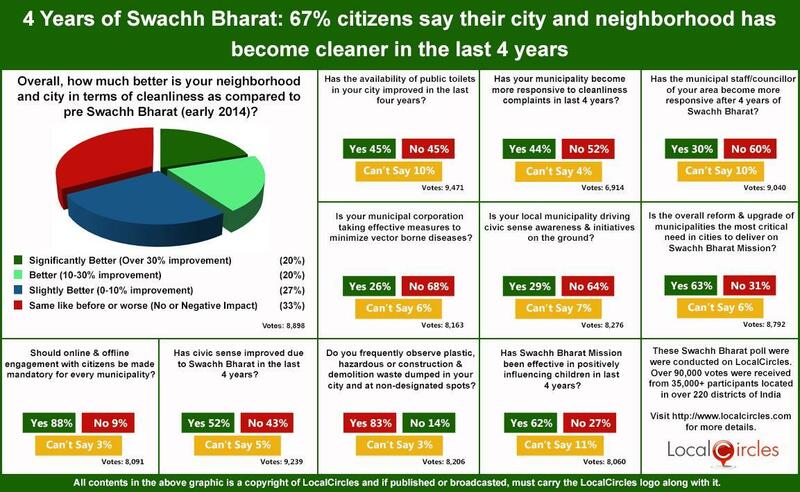 The first question asked overall how much better your neighbourhood and city in terms of cleanliness is as compared to pre Swachh Bharat (early 2014). 20% said it is significantly better (over 30% improvement) and 20% said it is better (10-30% improvement). 27% said it is slightly better (0-10% improvement) while 33% said it is same as before or worse (no or negative impact). 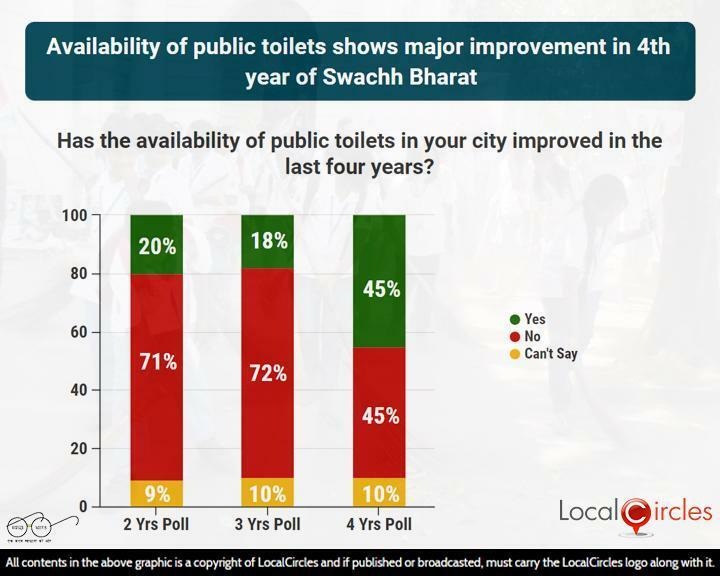 In the next poll, 45% said that availability of toilets in their city has definitely improved in the last 4 years, while an equal 45% said it has not improved. 10% were unsure about it. 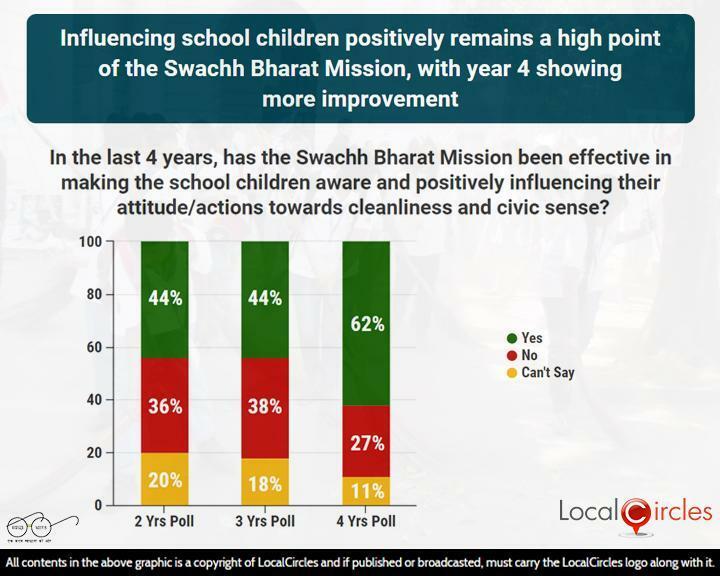 62% also agreed the last 4 years of Swachh Bharat Mission have been effective in making the school children aware and positively influencing their attitude and actions towards cleanliness and civic sense. 27% said it did not have any effect. 44% said that the municipality in their area has become more responsive in the last 4 years to complaints on garbage collection, waste disposal and street cleaning. 52% said they saw no improvements in this case. 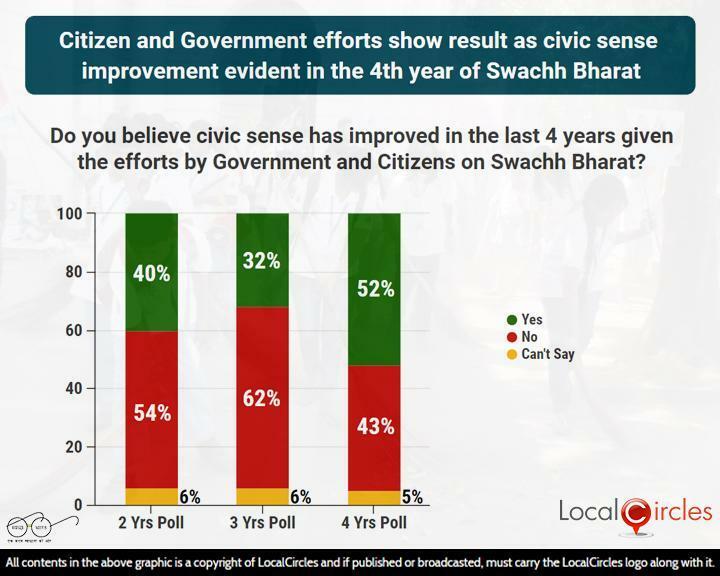 52% also believed that civic sense has improved in the last 4 years, given the efforts by citizens and government on Swachh Bharat. 43% voted against it. Next question asked if the municipal staff/councillor of your area has become more responsive after 4 years of Swachh Bharat. Only 30% agreed with it while 60% no. 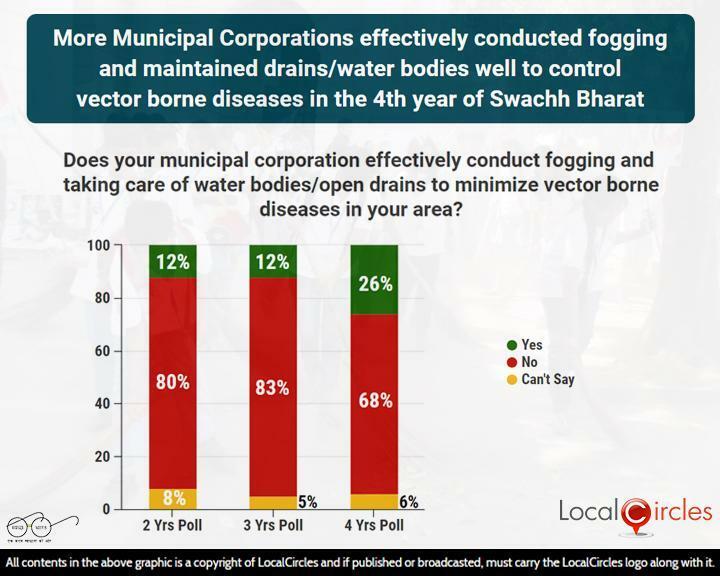 68% also said that the municipal corporation does not effectively conduct fogging and does not take care of water bodies/open drains to minimize vector borne diseases in their area. Only 26% answered in a ‘yes’. 83% also said that they frequently observe plastic, hazardous of construction & demolition waste dumped in their city along with garbage at non-designated spots. A small 14% said that the scenario has improved. Following question asked is their municipality is engaged in the Swachh Bharat Mission and driving cleanliness/civic sense awareness and initiatives on the ground. 29% said yes while 64% said no. 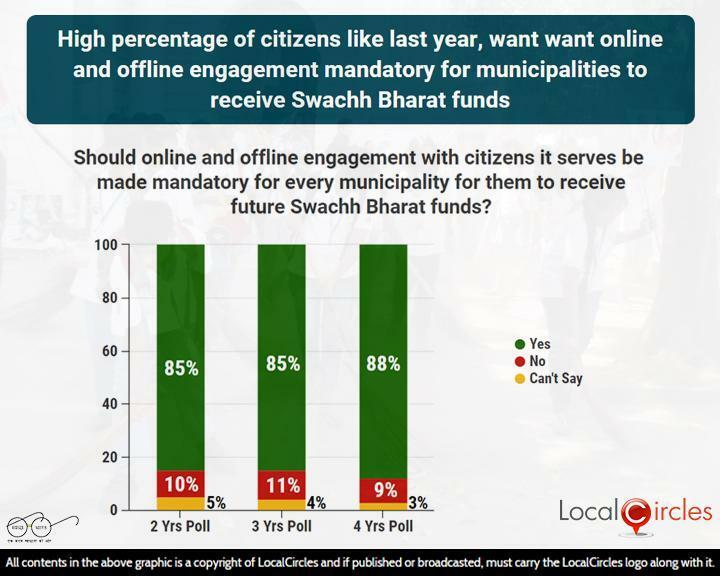 The last question asked if it should be made mandatory for the municipal corporations to engage with the residents of their area online and offline, to make them eligible to receive future Swachh Bharat funds. 88% agreed with it while 9% did not agree with it. In the next poll, 63% citizens said that they believe overall reforms and upgrade of municipality is needed and critical to deliver on Swachh Bharat. 31% voted otherwise. 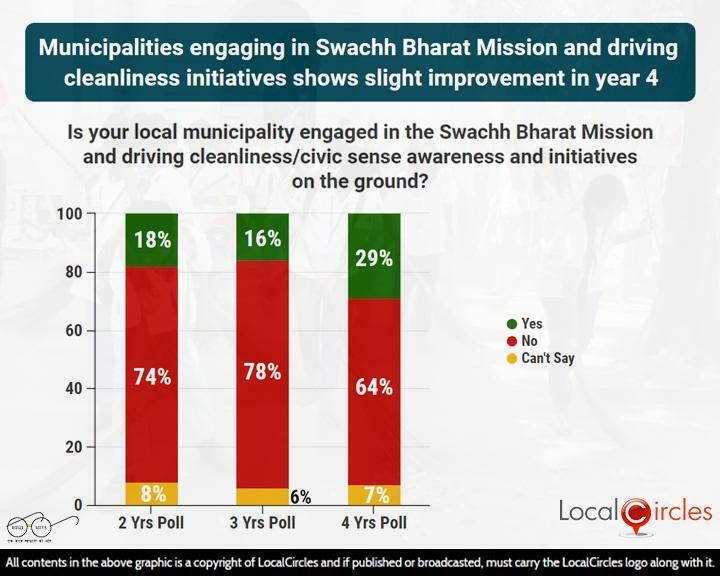 The survey to check the impact of the Swachh Bharat Mission was also conducted in 14 state level circles on LocalCircles and received an additional 24,000 votes. The results showed that Madhya Pradesh, Gujarat and Andhra Pradesh are the cleanest states after 4 years of Swachh Bharat. The results also showed that a large number of citizens in the states of Rajasthan, Maharashtra, Delhi, West Bengal, Uttar Pradesh, Karnataka and Kerala feel that their city is cleaner due to the impact of Swachh Bharat in the last 4 years. On the other hand, majority of citizens from the states of Telangana, Tamil Nadu, Punjab and Haryana felt that there has been no impact of the Swachh Bharat Mission in their states and the cleanliness condition are either same as earlier or have even deteriorated. 53% citizens find their area & city cleaner in Delhi after completion of 4 years of Swachh Bharat Abhiyan. 53% citizens find their area & city cleaner in West Bengal after completion of 4 years of Swachh Bharat Abhiyan. 53% citizens find their area & city cleaner in Uttar Pradesh after completion of 4 years of Swachh Bharat Abhiyan. 58% citizens see no impact in their area & city in Telangana after completion of 4 years of Swachh Bharat Abhiyan. 52% citizens see no impact in their area & city in Tamil Nadu after completion of 4 years of Swachh Bharat Abhiyan. 75% citizens see no impact in their area & city in Punjab after completion of 4 years of Swachh Bharat Abhiyan. 64% citizens find their area & city cleaner in Maharashtra after completion of 4 years of Swachh Bharat Abhiyan. 85% citizens find their area & city cleaner in Madhya Pradesh after completion of 4 years of Swachh Bharat Abhiyan. 55% citizens find their area & city cleaner in Karnataka after completion of 4 years of Swachh Bharat Abhiyan. 56% citizens see no impact in their area & city in Haryana after completion of 4 years of Swachh Bharat Abhiyan. 83% citizens find their area & city cleaner in Gujarat after completion of 4 years of Swachh Bharat Abhiyan. 77% citizens find their area & city cleaner in Andhra Pradesh after completion of 4 years of Swachh Bharat Abhiyan. 73% citizens find their area & city cleaner in Rajasthan after completion of 4 years of Swachh Bharat Abhiyan. On the 150th birth anniversary of Mahatma Gandhi, the biggest gift that the nation can give him, is to show him that we are collectively working towards achieving his dream of a clean India. Much improvement has been made in the last 4 years, but a lot still needs to be done to achieve the complete objectives of the Swachh Bharat Mission. The states which have done well this year will need to improve in the coming ear and the ones which have not been upto the mark need to try harder and create more awareness among citizens. More than 90,000 votes were polled in the survey from over 35,000 unique participants located in 220+ districts in India, making it the largest civic survey of its kind. Approximately 66% of respondents were males while 34% were females. The participants were 45% from Tier 1 cities, 29% from Tier 2 cities and 27% from Tier 3 Cities and Rural areas. More than 24,000 votes were polled in the survey from citizens located in 14 states in India. Approximately 69% of respondents were males while 31% were females. The participants were 48% from Tier 1 cities, 26% from Tier 2 cities and 26% from Tier 3 Cities and Rural areas.